This is the scene to my left as I sit at the computer late on the night of my firstborn child's ninth birthday. She lost a tooth today. The Tooth Fairy has already made her visit, though I have yet to head to bed. I know there is a sprinkling of fairy dust on my child's pillow and surrounding areas. There is a note, and two dollars -- normally the Tooth Fairy leaves two quarters, but a tooth lost on a birthday seems bigger than that, don't you think? -- under her pillow. 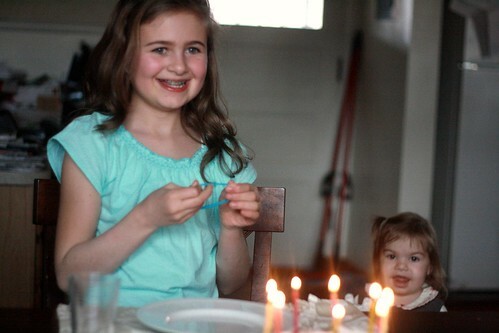 But I'm still up, reminiscing about this day, and these nine years of motherhood, and this daughter of mine. She served on the altar at church this morning, a responsibility she relishes. We played this game. The children read together. All through this day, I thought to myself, "I can still see the baby she once was in the girl she is now." I remember her tiny newborn face, in those moments after birth. And yes, this is still her. Yes, this is still the busy, dazzling, delicious toddler underneath those serious dark eyebrows and thoughful gray eyes. Yes, the sensitive and stubborn preschooler with the Shirley Temple-curls is still here, though we see her differently now, in our sensitive and strong-willed nine-year-old who is beginning to experiment with many new, intricate hairstyles. The nine-year-old who treated us to a "fashion show", twirling and dancing in her new (very "big girl", certain-styles-only-please) birthday clothes. 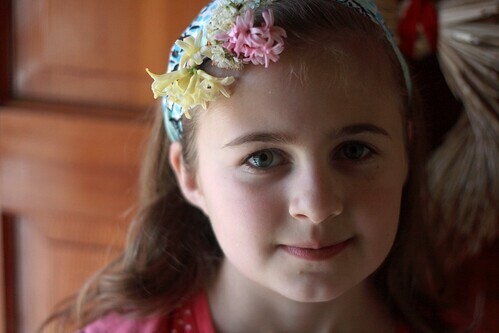 The flower-loving girl who treasures the early spring flowers of her season of birth. Who I saw stealing a peek at the end of one of her new birthday books. (Something her mother has been known to do, too.) 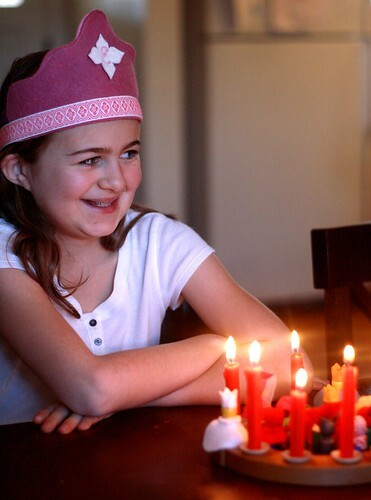 Who is still delighted to wear her birthday crown all day, just as she was when she first got it years ago. And who still believes in magic. 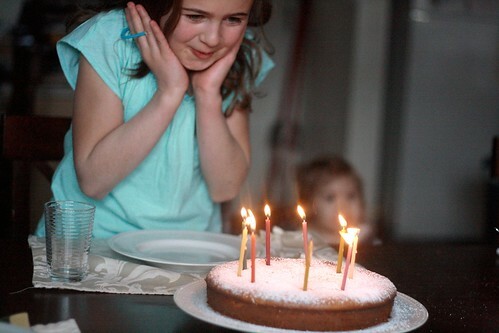 Shouldn't we all have some magic on our birthdays? Yes, I can still see my baby in my big girl. And I am amazed and surprised and excited to see the big girl that I never could have dreamed of back in the baby days. We are so blessed to have this incredible girl in our lives. Happy birthday, lovely Elisabeth! You mean everything to us.